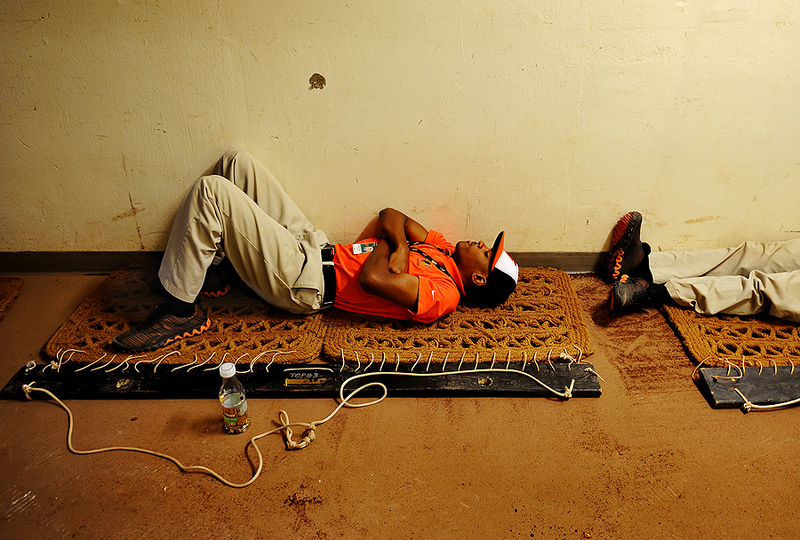 "Baltimore Orioles grounds crew member Donald Clark takes a nap on grooming mat between the third inning of an MLB game between the Baltimore Orioles and the Oakland Athletics at Oriole Park at Camden Yards on August 25, 2013 in Baltimore, Maryland." If there are two things that I love it's: serendipity and spontaneity. In photography, you truly never know what is going to happen in front of your camera. It's without saying, that often your inner thought process has something to do with it. Sometimes, your instinct leads you to pictures. Other times, you simply stumble across them. With that said, I love documenting sports. Yet, I truly love shooting behind the scenes features before, during or after. There is so much to be said about the world that the fans don't ever see - momentous or not. In the first two innings of baseball between the Athletics and Orioles, I had the itch to go upstairs and transmit my images early. There were lots of telling images because of a lot of hits and scores early in the contest. I tend to wait longer, specifically during an early day game, but something was telling me to go send between innings, rather than wait for the bottom of the inning to conclude. In my commute, I stumbled across this scene of the grounds crew napping between innings. I loved every second of it. A brief moment of peace for these hardworking kids that others may never see.